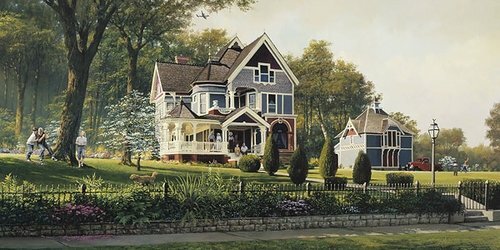 This print could be any small town in America - with those wonderful Victorian houses - children playing in the yard - and a plane flying overhead. You can imagine yourself sitting on that porch and wondering what the day will bring. Bill says - "I wanted to capture the joy of a warm spring day in the 1950s, with the flowers starting to bloom, the parents chatting, the kids playing, a beautifully maintained 1936 Ford pickup in the driveway and a grand CD-6 aircraft flying overhead.